I have a special place in my heart for Jazz at Chautauqua: it was the first jazz party I’d ever attended, an uplifting experience in every way. The 2011 Jazz at Chautauqua is taking place this year — September 15-18. Details to follow. This is the piece I wrote after my first experience of Jazz at Chautauqua. Joe Boughton is no longer with us, but the elation remains the same. On a Thursday evening in September 2004, two jazz musicians decided on Eubie Blake’s “You’re Lucky To Me” to begin their performance, set an affable, conversational tempo, and started – moving from embellished melody to more adventurous improvisations before coming back down to earth. They stood at one end of a small rectangular mint-green hotel dining room elaborately decorated with nineteenth-century chandeliers and moldings. The tall young trumpet player, apparently a college fullback, wore jeans and an untucked striped dress shirt; the pianist resembled a senior account executive for a firm that knew nothing of casual Fridays. As the applause slowly diminished, Duke Heitger, trumpet held loosely at his side, looked slyly at John Sheridan, the other half of his orchestra, grinned, and said, “Well, this’ll be fun.” They had just played the opening notes of the seventh annual Jazz at Chautauqua, a four-day jazz party held at the Athenaeum, the upstate New York site of the Chautauqua Institution – now a hotel unused for nine months of the year (no heating system). Appropriately, the site reflected something of the Chautauqua ideal of entertaining self-enrichment, now given over to a weekend’s immersion in the music once our common colloquial language. The imaginary map of American culture might seem a homogenous cultural landscape of Outkast, Diet Coke, press-on nails, and Paris Hilton. But there are millions of smaller, secret cultural nations pulsing all at once: people subversively playing Brahms at home, wearing hemp clothing, and making sure that what commercialism has consigned to the past is kept alive. One of those underground institutions is the jazz party – an idea quietly subsisting for forty years, now one of the only venues for this music. If a newcomer assumed that a “jazz party” is nothing more than two or three semi-professional musicians playing background music for a roomful of people, perhaps a singer seated atop a piano, Jazz at Chautauqua would be staggering. It featured nearly thirty-three hours of nonstop music played to two hundred and fifty people between Thursday evening and Sunday afternoon by twenty-six musicians: Bob Barnard, Heitger, Jon-Erik Kellso, Randy Reinhart, and Joe Wilder (trumpet, cornet, and flugelhorn); Dan Barrett and Bob Havens (trombone); Harry Allen, Dan Block, Bobby Gordon, Bob Reitmeier, Scott Robinson (reeds); Johnny Frigo (violin); Jim Dapogny, Larry Eanet, Keith Ingham, and John Sheridan (piano); Howard Alden and Marty Grosz (guitar); Vince Giordano, Nicki Parott, and Phil Flanigan (bass); Arnie Kinsella, Eddie Metz, Jr., and John Von Ohlen (drums); Grosz, Rebecca Kilgore, and Parrott (vocals). These players are unknown to a general audience but are both remarkable and sought after. Except for Wilder, the musicians were white, (which didn’t bother him: he was delighted to be playing among friends) and many hailed from the tri-state area, with a few startling exceptions: Barrett and Reitmeier flew from California, Kilgore from Oregon, and the winner for distance, Barnard, from New South Wales. Most of them were middle-aged (although Parrott and Heitger are not yet forty), looking oddly youthful (I think that joy transforms), but jazz musicians, if fortunate, live long: Frigo is 87, Wilder, 82. A listener, fortified by food at regular intervals and consistently available drinks (for me, an excess of caffeine for medicinal purposes – a jam session started while I was asleep on Thursday night, and I was anxious that I miss nothing else) may sit in a comfortable chair and listen to eight hours of jazz in short sets, from fifteen minutes for duets to an hour for a larger band. It was overwhelming, as though someone who had only read about model trains or Morris dancing had wandered into a convention of enthusiasts where everything in the ballroom focused on the chosen subject, non-stop. But Chautauqua was more than a museum: it offered the art itself in action, unfettered and created on the spot. All this is due to its creator and director, Joe Boughton, who feels a moral compulsion to preserve the music he first heard in the Boston area in the late 1940s. Boughton is a solidly packed man who in profile resembles a Roman general, but his more characteristic expression is pleasure when his musicians are playing well and his audience is reverent. He is the enemy of needless chatter unless it comes from the bandstand, and printed cards decorated each table, reading, “Afford our artists the respect they deserve and be considerate to those at your table and surrounding tables who have come from long distances and paid a lot of money to hear the music and not be annoyed by talking.” That contains Boughton’s voice – low-key but impatient with nonsense. He is also a one-man campaign to rescue jazz from the deadening effects of a limited repertoire. Jazz musicians who are thrown together on the stand choose familiar songs: variations on the blues, on “I Got Rhythm,” “Sweet Georgia Brown,” as well as crowd-pleasers “Take the ‘A’ Train” and “Satin Doll,” which Boughton calls “Satin Dull.” At Chautauqua, now-rare melodies filled the air — jazz standards ranging from King Oliver’s “Canal Street Blues,” circa 1923, to the Parker-Gillespie “Groovin’ High” of 1945 and John Lewis’s “Skating In Central Park,” but rare once-popular surprises, including “I’m Sittin’ On Top of the World,” “Smiles,” “Ida,” “Aren’t You Glad You’re You” and “Moon Song.” Although the songs might seem antique, the approach is not self-consciously historical: the young tenor saxophonist Harry Allen (to cite only one example) who delivers eloquent solos while standing motionless, once leaning against the bar, would fit in well with the bebop legend Clifford Brown or the Harlem stride master James P. Johnson. Gin in its naked state was then provided. Flanigan’s commentary was not the only surprise – especially for those who consider jazz musicians as inarticulate, concerned more about reeds than realities. The next day, I had attached myself to Joe Wilder for lunch. The conversation, steered by Wilder, weaved around memories of his friends, famous and not – but he really wanted to talk about Iraq and eco-devastation, and his perspective was anything but accepting. Friday began with rain, and the hotel corridors were ornamented by white plastic buckets; from one room I heard an alto player practicing; behind another door trumpeter Jon-Erik Kellso was turning a phrase this way and that in the fashion of a poet accenting one word and then another while reciting the line half-aloud. I spent some costly time entranced by the displays of compact discs, buying and considering. Later, the party began officially in the main ballroom with fourteen musicians (six brass, four reeds, four rhythm), stretched from left to right, jostling for position on the stage of the main ballroom, played “Way Down Yonder in New Orleans,” at its original, yearning tempo, with the trumpeter Randy Reinhart directing traffic, the musicians creating simple chordal backgrounds of organ tones played in whole notes (called “footballs” for the way they look on music paper) and the brilliant anachronism Vince Giordano switching from his bass saxophone (an instrument out of fashion by 1935) to the only aluminum double bass I have ever seen, as the spirit took him, the convocation suggesting Eddie Condon meeting Count Basie in 1939. The set that followed was a masterpiece of small-band friendship, featuring Allen, Wilder, Block (on alto), the underrated Washington, D.C., pianist Larry Eanet, Howard Alden, Flanigan, and Von Ohlen. In forty minutes, they offered a strolling “If Dreams Come True,” with Flanigan beginning his solo with a quote from the verse to “Love in Bloom,” a speedy “Time After Time,” usually taken lugubriously, with the melody handed off among all the horns and Alden in eight-bar segments, an even brisker “This Can’t Be Love,” notable for Eanet, who offered his own version of Hank Jones’s pearls at top speed and for Wilder – who now plays in a posture that would horrify brass teachers, his horn nearly parallel to his body, pointing down at the floor. His radiant tone, heard on so many recordings of the Fifties, is burnished now into a speaking, conversational one – Wilder will take a simple, rhythmic phrase and repeat it a number of times, toying with it as the chords beneath him go flying by, a Louis Armstrong experiment, something fledgling players shouldn’t try at home, and he enjoys witty musical jokes: quoting “Ciribiribin” and, later, “Mona Lisa,” in a solo on “Flyin’ Home.” Often he brought out a bright green plastic cup and waggled it close to and away from the bell of his horn, creating growly, subterranean sounds Cootie Williams would have liked. (“From the five and ten,” he said, when I asked him about the cup.) Wilder’s ballad feature, “I Cover the Waterfront,” was a cathedral of quiet climbing phrases. And the set closed with a trotting version of “The Jeep is Jumpin’,” a Johnny Hodges riff on “I Got Rhythm” changes, played the way it was in 1941, before musicians believed that audiences needed to hear everything faster and louder. Friday closed with Vince Giordano’s Nighthawks, an explosive ten-piece band, replicating late Twenties and early Thirties jazz and dance orchestras. Giordano, who resembles a movie idol who could have partnered Joan Blondell, is remarkable – an eloquent melodist and improviser on his unwieldy bass saxophone, where he gets a room-filling tone both sinewy and caressing; his aluminum string bass, ferociously propulsive tuba, and boyishly energetic vocals. The Nighthawks reunion band featured whizzing tempos, bright solos, and on-target ensemble passages on a for-dancers-only repertoire, circa 1931, Savoy Ballroom. Most listeners have never heard a band like the Nighthawks live – they shout to the heavens without being extraordinarily loud, and their ensemble momentum is thrilling. Hoarse and dizzy, we climbed the stairs to our rooms at 1:30 AM. Saturday morning began sedately, with solo piano, some pastoral duos and trios, and then caught fire with a Kilgore-James Dapogny duet. Dapogny is a rolling, rumbling pianist in the style that used to be called “Chicagoan”: right-hand single note melody lines, flashing Earl Hines octaves, stride-piano ornamentations supported by a full, mobile left hand, and he and Kilgore had never played together before. Kilgore let herself go on the nineteenth-century parlor favorite “Martha,” subtitled “Ah! So Pure!” which Connee Boswell took for a more raucous ride with the Bob Crosby band sixty-five years ago. Kilgore’s approach was gliding and swinging, with hand gestures that would not have disgraced a Victorian songstress or a melodramatic 1936 band singer (a raised index finger for emphasis, a gentle clasp of her own throat), but the sly glint in her eye and the sweetly ironic quotation marks in her delivery suggested that Martha’s purity was open to question. Then came a trio of Dan Barrett and Bob Havens on trombones, backed only Marty Grosz, someone his Chicago comrade Frank Chace has called “a one-man rhythm gang,” in a short set notable for fraternal improvising and Barrett’s interpolating one vocal stanza of a lewd blues, “The Duck’s Yas Yas” into “Basin Street Blues.” More brass ecstasy followed in a trumpet extravaganza, ending with a six-trumpet plus Barrett version of Bunny Berigan’s famous “I Can’t get Started” solo, by now a piece of Americana, with the ballroom’s walls undulating with the collective passion. The Nighthawks played an afternoon session, full of exuberance and wit: Giordano, calling a difficult tune for the band, smiled at his players and said, “Good luck, boys,” in the manner of Knute Rockne encouraging Notre Dame, before they leapt in to the forests of notes. And it wasn’t all simply hot music: where else in America, I wondered, could you hear someone sing “Okay, Baby,” with its deathless, funny lyrics about the romantic couple: “The wedding ring I’ve bought for you / Fifty-two more payments and it’s yours, dear”? Grosz followed with a set devoted to those musicians who would have turned 100 this year – Coleman Hawkins, James P. Johnson, Jimmy Dorsey, and Fats Waller, where Grosz (who knows these things, having come here from Berlin as a child in 1930) commented, “America is the land of easy come, easy go,” before singing a Waller ballad, “If It Ain’t Love,” as tenderly as if he were stroking the Beloved’s cheek. Sunday morning began with a solo recital by guitarist Howard Alden, which itself began with a rueful “Blame It On My Youth” – Alden also had elevated all the rhythm sections of the bands he had been in, as well as being a careful, lyrical banjo soloist with the Nighthawks – but the temperature of the room soon rose appreciably. A nearly violent “It’s All Right With Me” featured three storming choruses of four-bar trades among Harry Allen, Wilder, Barrett, and Dan Block; Duke Heitger closed his set with an extravagant “You’re Driving Me Crazy,” with its seldom-played stomping verse, here played twice before the ensemble strode into the chorus; the band supported by Grosz, constructing chordal filigrees at a very fast tempo; Giordano, slapping his aluminum bass for dear life, and Ed Metz, Jr., recalling Zutty Singleton, Armstrong’s drumming pal of the late Twenties, if Singleton had gone to the gym regularly. Then it was time to go, to close with another Boughton extravaganza – a ballad medley lifted up greatly by Scott Robinson’s “Moonlight Becomes You” on bass flute, Jon-Erik Kellso’s “Willow Weep For Me,” growled as if he had become one of Ellington’s brass in 1929, and the clarinetist Bob Reitmeier’s soft “Deep Purple.” These heartfelt moments gave way to the true closing “After You’ve Gone,” which featured impromptu piano duets among the many pianists, and an uproarious enthusiasm – greeted with the cheers it deserved. I wasn’t surprised that on Sunday afternoon, driving back through Erie, Pennsylvania (where Lloyd’s Fireworks advertised “pepper spray, stun guns, sale on Lord of the Rings tape”) that my thoughts drifted back to Heitger’s Thursday-evening prediction. Yes, there had been too much white and blue hair to make me feel confident about the future of the audience, Flanigan notwithstanding; there had even seemed to be too much music, pushing me to the brink of satiety, and it had all been evanescent – but Heitger had been right: it had been fun. And just so my readers don’t forget the present and future while celebrating past glories: this year’s Jazz at Chautauqua will include (in egalitarian alphabetical order) Alden, Allen, Barrett, Block, Jon Burr, Dapogny, the Fauz Frenchmen, Grosz, Havens, Heitger, Glenn Holmes, Ingham, Kellso, Kinsella, Kilgore, Dan Levinson, Bill Ransom, Reinhart, Robinson, Sandke, Andy Schumm, Sheridan, Pete Siers, Rossano Sportiello, Andy Stein, Lynn Stein, Frank Tate, Von Ohlen, and Chuck Wilson. That should provide sufficient music for a weekend! See and hear more about Tenor Madness at http://www.myspace.com/tenorguitarmadness. Wow! If you saw the title and assumed that this was a Sonny Rollins tribute band, get that thought right out of your head. As much as I admire Rollins, the tenor saxophone is sufficiently well-established in jazz so that it doesn’t need the extra publicity. I’m only sorry that the picture is bite-sized, for it captures Phil Flanigan, heroic bassist, his wife Hanna Richardson, a wonderfully unaffected yet hip singer (and tenor guitarist), and Tom Bronzetti (also on tenor guitar). Oh, say can they swing! They have a MySpace page, where you can hear them and see where they are playing next: http://www.myspace.com/tenorguitarmadness. 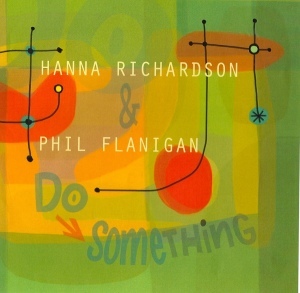 I’ve been an admirer of Hanna and Phil’s for some years now, ever since I was asked to review their first CD (on the LaLa label) for the late lamented Mississippi Rag — I became a fan as well as a convert to their insouciant swing. Jazz party producers, are you paying attention? This trio is compact yet their swinging music pours out generously. And they don’t care if the piano in your living room is out of tune. I predict great things!